Yesterday was about as blatantly obvious a selection as possible...the legendary Super Mario Bros. Today, we come to the first Agency Group representative from the 1990s...a game with style, sound and speed that's still more unique than the lion's share of current racers. The Agency Group: Super Mario Bros.
Every game has its own distinct style that at least tries to set itself apart from its contemporaries...but it's different to talk about a game's style and to say that it has style. Wipeout XL - also known as Wipeout 2097 - has style in spades. The successor to a PSX launch title, XL refined the sleek, industrial hovercrafts of the previous game and created winding, futuristic tracks to race across that amazed and compelled. Everything about Wipeout XL was built with an eye on "the future", and yet it didn't sway too far in the typical cyberpunk direction to become caricature, instead relying on distinctive designs and colors to draw the eye's attention. That track design still impresses, though in order to get a full grasp of how spectacular it was at the time, one has to remember how uncommon this type of racing game really was. Racers could take a simulation route, like the then-upcoming Gran Turismo. They might go whimsical, like Super Mario Kart. They could replicate the arcadey personas of Outrun or Crusin' USA or maybe try pushing for crashes or combat, like Twisted Metal. But few racers simply let you go fast and built the game around sheer glorious racing like Wipeout XL. You didn't have characters to get to know or a story to follow. Here, it was just about looking cool, going fast and trying not to explode in the process, and that helped define the PlayStation as a different kind of console. The obvious predecessor is F-Zero, but that game stayed largely grounded. 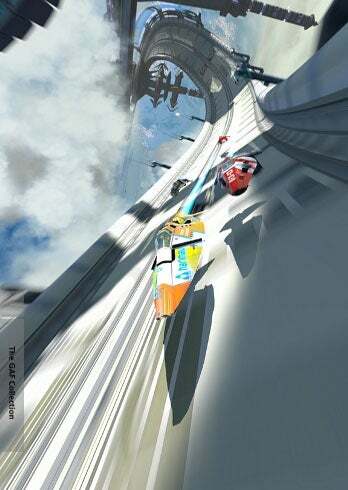 In Wipeout, your cars not only hovered, but flew across giant expanses, zoomed through varied environments from cities to forests to tunnels underground and the sky above. The air brake has become a staple of most racers but here it was still relatively new, and while it was easy to use, it was also very easy to overdo. Plus, with the weapons that established new benchmarks for upcoming games, a driving error could be very costly. However, if you messed up, crashed into a wall, and were resigned to 4th or 5th place, at least you had an amazing soundtrack to go with it. Years before electronic music's recent sweep across the globe, Wipeout's European developers arranged a litany of notable artists such as Daft Punk, CoLD SToRAGE, The Chemical Brothers, Underworld and The Prodigy to contribute to one of the first licensed soundtracks in gaming. The effect was remarkable, and meshed perfectly with the game's overall aesthetic. Nowadays licensed songs for a variety of games are the norm, but Wipeout was a pioneer in that realm. Sadly, this is a series that, appropriately enough given its aesthetic might just have been ahead of its time. Psygnosis is no longer in business and the Wipeout series floats in limbo, without a developer to carry that exquisite graphical style to the next generation. But I have little doubt that some developer will see the genius in reviving this future-focused series, in harnessing the current popularity of electronic music and in plain old going fast. In the meantime, we'll have to satisfy ourselves with the blistering speeds of the series' most recent entry, Wipeout HD for the PS3. You can download the most recent entries on the PlayStation Network; as for XL, you'll have to look at Amazon or EBay and be willing to pay. Next up: The only game that could credibly be called a national sport.